With these words, uttered during a concert I attended last year, Natalie Pa'apa'a aka Nattali Rize won my ears and heart, as certainly countless others'. It is simply impossible to withstand the charm, conviction and energy of this delicate but vigorous woman, who managed to climb to international renown so quickly and now proudly presents her new album Rebel Frequency. 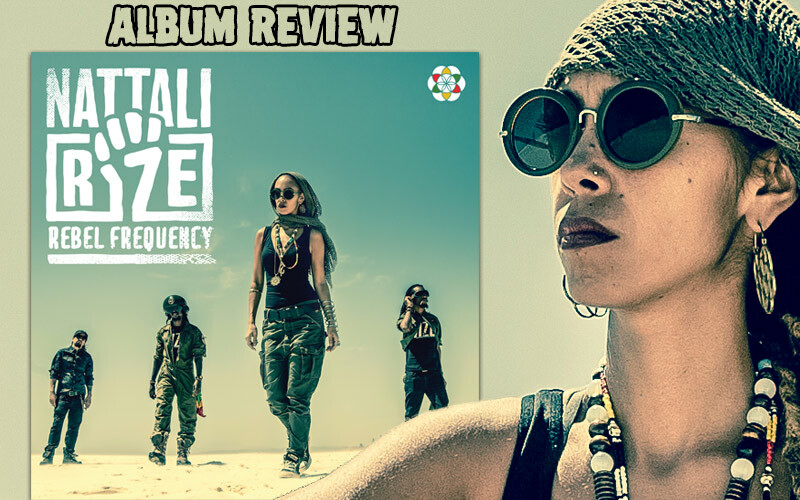 In Baco Records, a label created in 2001 by members of the French band Danakil that has risen to one of the main independent Reggae labels in France, the artist seems to have found the perfect match for her second release. Her long-time companion Carlo "One Rebel" Santone produced eight of the twelve tracks included and created the part rebellious, part rock, part traditional Reggae sound of the album. Faster and harder than any of these, Heart Of A Lion is the outcome of a collaboration with Jamaican Notis Heavyweightrockaz, who are also responsible for the much more gentler Fly Away featuring Raging Fyah and the hymnic Generations Will Rize with Kabaka Pyramid. Hold on! Actually, the featured artists in themselves are already a seal of quality, and speak of the deep connections she has to the contemporary Jamaican music scene. Apart from the ones mentioned above, we also find Dre Island and Jah9 on Evolutionary, a song produced by Wayne "Lotek" Bennett, and even Julian Marley with whom she intones the missionary Natty Rides Again. The rest of the songs, the artist shoulders by herself, occasionally helped by the well-in-demand background singer Tamekia "Tammi T" Moncrieffe. Lyrically, Nattali touches on subjects such as liberation in the title track Rebel Frequency, resistance in Hypocrisy and education of self in Free Up Your Mind. Nice plus: all of these texts and more can be read in the booklet! The beauty of Meditation, however, doesn't lie in its words alone. The song has an audible magic touch by the extraordinary Phillip "Winta" James (here on keys) and guitarist Lamont "Monty" Savory, as well as by Wayne Thompson on drums and Jason Welsh on bass. And, of course, the beauty lies in Nattali's voice as well. While it lashes out strong and powerful in Warriors (accompanied by an equally strong and powerful electric guitar), it proves to be tender to the point of breaking with emotion in songs like the haunting all-acoustic ballad One People. This ability to reach out to and touch her listeners has already impressed me deeply whenever I saw Nattali perform live, as mentioned above. Whether in Hamburg or in Ostroda, she addressed the audience in German and Polish respectively, creating connectivity. In case you haven't seen her yet (or you want to experience her live again), there is ample opportunity to do so during her European tour kicking off next week. Rize again!